My classroom is my home away from home. I spend all day there with a whole bunch of kids and I would like it be pleasantJ So, I try very hard to create an atmosphere that is free of chaos, stress, and discord. One of the ways I try to do that is to make sure I am not constantly disciplining, intervening, or being interrupted. I use a combination of explicit instruction and practice of routines and procedures, developing relationships with children, and keeping an organized space where the students can help manage materials and themselves. I have written previous posts on routines and procedures and developing relationships so on to fairness and trust! Fairness and trust are paramount to developing relationships with children in the classroom. Children must be able to completely trust me and know that I absolutely believe in them. If they are to trust me, then I must be fair and honest with them. Developing an environment of fairness and trust is one of those classroom goals that is hard to completely quantify. It doesn't always follow the flowchart and every individual situation is different, so I have to work crazy hard to make it happen. Some parts of it are fairly straightforward like being honest with my kids, apologizing when I make a mistake, and preserving the dignity of others. Other parts like logical consequences and consistency have been more challenging to master. 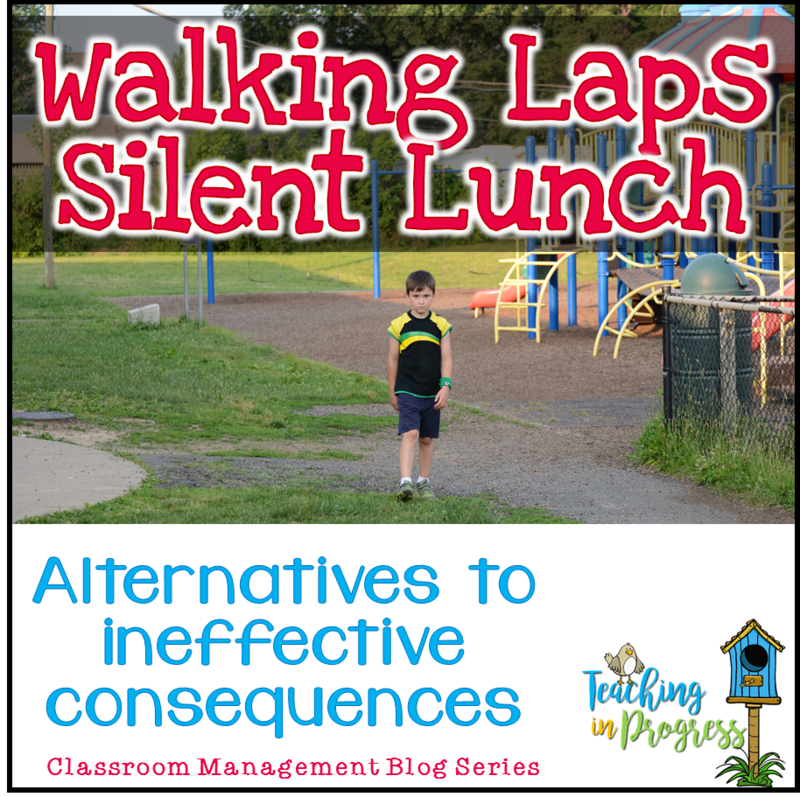 Logical consequences should be as immediate as possible and the “punishment fits the crime.” So, I will not tell a kid to walk laps or sit out at recess because he threw food at lunch. A more logical consequence would be to clean up after lunch and that may mean he misses some of recess while he’s cleaning. Missing a few minutes of recess because he is cleaning up his mess is much more powerful than just walking laps as punishment. Throwing out consequences for every infraction usually does not change behavior. Not to say, it doesn't always work. But to what cost? Her is an incident that happened to my oldest boy that illustrates how just meting out punishment creates an atmosphere of resentment that can lead to all sorts of unintended consequences. But towards the end of the year, when his fifth grade teacher was clearly done, I got some interesting news – he had refused to walk punishment laps at recess and the teacher sent him to the office! Now, what would drive an over achieving, rule following, teacher pleasing kid who had never been in trouble at school in his life to that kind of behavior? Let’s back up to that morning. He forgot to get his planner out of his backpack and had to go back to the closet for it. The teacher gave him 5 laps – her designated punishment for forgetting something in the backpack. About an hour later, he got 5 more laps because he asked to go to the bathroom during class. And then, 5 more laps for not having a sharpened pencil. Not that he was disrespectful, but that he recognized that things had gone way out of control, that pouring out of piles of consequences was unfair and he was attempting to stand up for himself. So my questions are – In what way were his consequences logical? How were those consequences going to help change his behavior? Was the student/teacher relationship strong, respectful, fair, and honest? Was he going to trust his teacher enough to be able to dare to try and fail? What would have been better choices for consequences? Were consequences even necessary? The only result from her form of discipline was a distrustful, resentful child, a frustrated teacher, a busy principal bothered when she needn't have been, and a highly irritated parent. This happened a couple of years ago and he is still an awesome student. He has learned to trust teachers again, but he knows which ones truly care about him and which ones are phoning it in. Sometimes determining the most logical, dignity-preserving, consistent consequence is tough. Teachers have to make a gazillion decisions a minute and try to make these choices on the fly sometimes. It’s not easy, but I believe it’s worth it. Any time we are unfair, dishonest, or untrustworthy, we are providing an environment where a child may not try new things if failure is possible because they do not trust that they will be safe when they do so. Most of the time, I don't give consequences for minor everyday things. If it becomes a habit for one or two kids to always forget to put their folder in the basket, then I will come up with a plan to help them remember, not give them consequences for forgetting. If Sam loses his pencil once or twice - no big deal. If he does it everyday, what can I do to help him learn to remember? Ultimately, I want my kids to learn to do the right thing and be responsible and I don't think punishment is the way to achieve that. I only use consequences when behavior is repeated, negative, and intrusive. And it is easier to determine consequences for those sorts of behaviors. I am going to keep working to be as fair and honest and trustworthy as I can, knowing that I will mess it up sometimes and I will get it right sometimes (hopefully more times than I get it wrong!) I will make every effort to create a classroom atmosphere that helps kids feel safe enough to fail, strong enough to succeed, and empowered enough to come to me openly and respectfully when they feel wronged. I've Given Up the Color Chart - Now What? Sorry that happened to your son. Unfortunately I think there are still classrooms where this happens. What are some of your other logical consequences for classroom behaviors? For example, what would be logical consequences for the WBT five rules? I love the idea of logical consequences and try to stick to that, but sometimes the ideas aren't there. I use (modified)WBT rules, too, and I typically do not give consequences for breaking those rules. I redirect and move on. If kids are repeatedly breaking a rule, I try to determine why, and how I can help them follow that rule or procedure before I consider consequences. I have found that regularly not following rules and procedures is usually a symptom of something bigger. But, if after all of that, I am still not getting through to someone, then we'll come up with consequences. So, for 'follow directions quickly' - if I have already redirected repeatedly, and tried to determine why the little friend won't do this, then the consequence might be to be removed from the activity so that those who are following directions can fully participate. Or maybe that friend has to complete the activity later when others have some free time. I agree . . . sometimes its hard to think of logical consequences off the cuff though. Some are very easy . . . others not so much. My school is implementing Responsive school techniques and I really try my hardest to be fair at all times. Thanks for the write up! And by the way- your son's teacher sounds like a control freak! I expect the best from my students, but really . . . life happens- kids forget stuff in their backpacks, they have to go to the bathroom, and their pencils break- I wonder what kind of teacher she had once that would make her run her classroom like that. She really is a hot mess. She gets completely bent out of shape when kids don't do what she wants but she never taught the routines and procedures in the first place. And we had to go through it twice because my middle son came right behind his older brother! I feel sorry for her because I am certain that most days are very stressful for her. Do there always have to be consequences? If it becomes a pattern for a certain student, I would try to figure out why and help him overcome that instead of punishing the forgetfulness. Tammy that reminds that maybe I should pick up my love and logic book again this summer. Thank you for this. You have no idea how much this has helped me as I prepare for the week! Awww! I'm glad it helped! I agree with Tammy that this sounds a lot like Love and Logic. It's a very good reminder, but I also know that sometimes it's really hard to find an appropriate consequence -especially off the cuff on a crazy day in May. Sometimes teachers get desperate when their world crumbles out of control. I think what we need now is a list of "do this" if they "did that"! LOL! Yes, May does kind of get to us all, doesn't it:) And we won't even talk about June! It makes me so sad when teachers do things like this. A friend of ours has a daughter whose teacher had them run "thinking laps" AS A CLASS when a few students were out of line. Third grade, and she was too scared to even speak. How can kids learn when they are afraid!? I realize this is an old post, but I came across it while doing a google search about silent lunches. I wish more teachers were like you!!! LOVE this Blog and especially this post! Thank you! I am so very glad that I stumbled upon your blog. I am going into my first year of teaching and your words are touching my heart. As a 40 year old mother of 2 teenage superheroes, I am a fan of natural consequences and second chances. No one is perfect and I would like to see more adults remember that these Littles are not finished yet. I want to be their cheerleader and guide, rather than their warden. I hope I remember to share this post the day after Halloween this year. Oh how I wish all teachers were like you! Some of the kids act out because of home environment and feel like outcasts at school. Then to have them walk laps alone, sit alone, etc, must make them feel even more outcasts and labeled. Genuinely caring about kids and determining the 'why'behind the behavior is the only logical, compassionate way to handle discipline..
Silent lunch TOTALLY works in high school. Our tardy rate went down 75% by assigning lunch detention as a consequence. I like your positivity and they way you strategically go after antecedents to stop a behavior. I think the laps assigned in the way above is taking something that could potentially be helpful way too far. Recess is a great place for a reflective lap or two as long as it doesn't swallow up the entire recess, nor be allowed to carry over to the following day. However, in some cases, this type of Tier I consequence has some merit when it is used in place of a consequence that causes the teacher and/or student to lose instructional minutes writing a referral and sitting it out in the office. When paired with a class-wide reward system for positive behavior, it is an unfortunate but necessary part of the system. I am interested in hearing your further thoughts. This makes me so sad because my school has just started using exercise as punishment! If students don't finish their work, they have to run. If they act out, they have to run. If they are disrespectful, they have to run. As if somehow running is the cure to all school issues!! I am so sad that the students at my school are being taught the exercise is punishment. What if there is a child who is daily doing harm to other children in the class in preschool? Either hitting or spitting or laughing at other kids? That child is one who needs additional interventions beyond the normal classroom management. He needs specific, and probably outside, intervention. But, that kid probably needs reces more than anyone. And honestly, missing recess won't change his behavior anyway so let him run and move and play. He likely is already ostracized by his peers for his behavior and not letting him have any free play with will make it worse. You might have to shadow him to keep him and the others safe, or maybe set specific play perameters and spaces for him. I have done that for a few kids so they could play but not create havoc. Hi, Just stumbled upon your blog. I was just curious about the demographics of the students you work with? I teach in a full Title 1 school with about 70% free lunch, very high transiency rate, around 65% African American, 30% Hispanic.